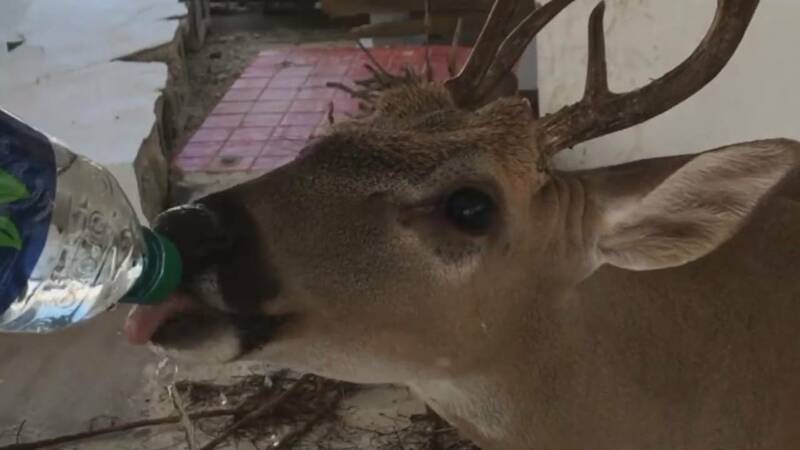 This thirsty Key deer drank four bottles of water that Lt. Nicholas Johnson gave to the endangered animal. KEY WEST, Fla. - A Broward County firefighter who was helping with the Hurricane Irma recovery efforts in the Florida Keys stumbled upon a Key deer while surveying an "incredibly damaged" home. "I don't know who was more scared, myself or the deer," Broward Sheriff's Office Department of Fire Rescue Lt. Nicholas Johnson said. Johnson said the deer looked thirsty, so he got some bottles of water to give to the endangered animal. He said the deer drank all four bottles before running away. "It's nice to help out the wildlife, as well as the citizens of Monroe County," Johnson said.